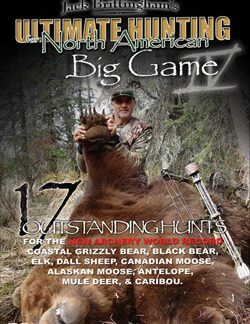 Once again our Ultimate Hunting team puts a whole new meaning to the word BIG in big game hunting. 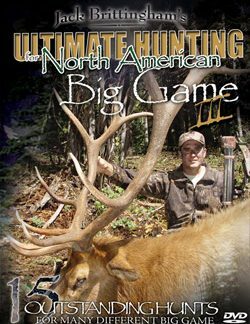 Share in the awe of some of the most awesome big game animals ever taken with gun and bow in front of the camera from across North America. 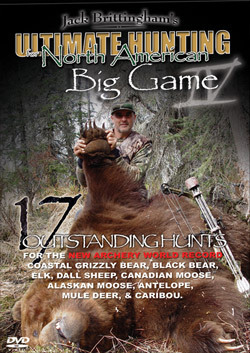 Feel the rush of facing the world’s biggest bears with no place to run or hide in the Alaskan wilderness as Jack Brittingham arrows the largest coastal grizzly ever taken with bow and arrow. You’ll be stunned at the size of this mammoth bear and how it reacts to the arrow. Hear the bugling of rutting elk in New Mexico’s high country as these monarchs of the mountains bring out the primal essence of spot and stalk hunting. Venture to the remote corners of the continent after giant Alaskan and Canadian moose while also trekking into the craggy slopes after Dall sheep. Experience the thrills and uncertainty of facing Alberta black bears at close range with bow and arrow, and pursuing massive antlered Quebec caribou across the tundra. And finally, roam the sage-scented Southwest in quest of sharp-eyed pronghorns with bow and arrow and massive mulies in the hills. 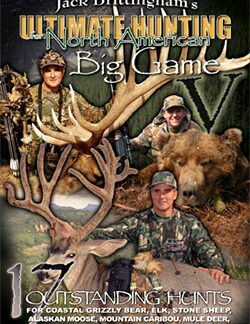 As a bonus, we’ve again included an offer to win a Free European Wild Boar Hunt for all who purchase this Ultimate Hunting for North American Big Game IV. See details inside box.